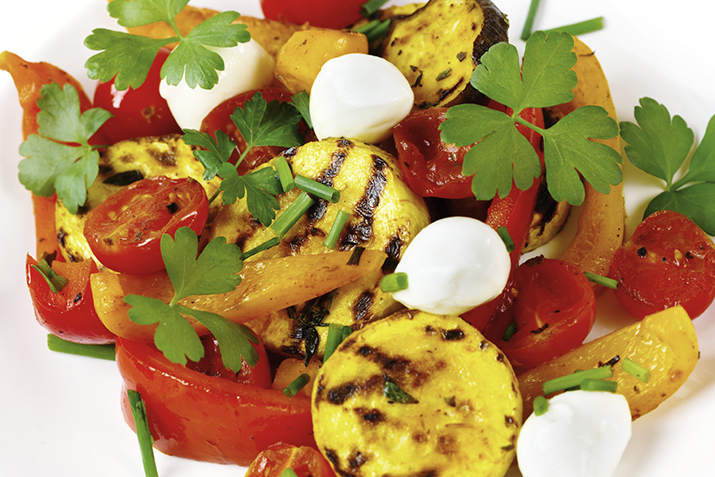 Grilled vegetables are delicious and easy to cook. Take advantage of summer's vegetable bounty with this simple recipe. In a large bowl, combine all marinade ingredients. Add the prepared vegetables and marinate 30 minutes, turning often. Heat your gas or barbecue grill on medium-high. Remove the vegetables from the marinade and grill until cooked through, about 5 minutes, turning often. Season the mozzarella with olive oil, salt, and pepper. Arrange mozzarella slices around the edge of a serving platter. Remove the vegetables from the grill and layer the eggplant first in the center of the platter, then zucchini, and top with bell peppers. Drizzle with leftover marinade and garnish with basil.